1) Focus on the most important aspects of any data you are given. Do not quote the data mechanically. Link your ideas together naturally while referring to specific data. 2) Think about the most significant changes over time or the key points of comparison between different categories. 3) Organise your description of the data around these key points, and include any relevant secondary points. The bar chart below shows the percentage of students who passed their high school competency exams, by subject and gender, during the period 2010-2011. Look at the graph and complete the following model answer by writing NO MORE THAN THREE WORDS in each space. 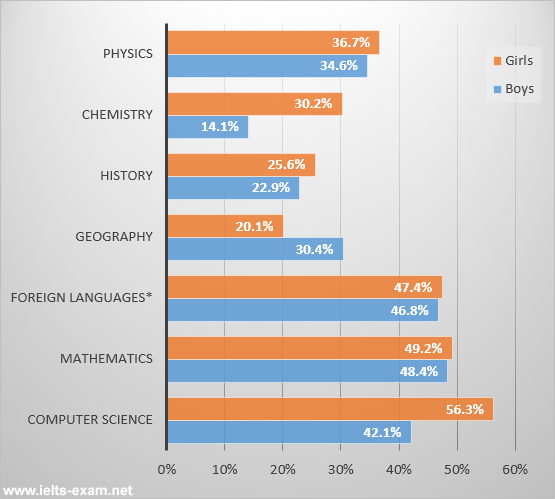 The graph shows the percentages of boys and girls who were successful in their high school competency exams in the period from 2010 to 2011, by subject. Girls achieved by far their .......... in Computer Science, with a pass rate of .........., which was .......... than the boys. The difference was even .......... in Chemistry, where .......... more girls passed. .......... subject where boys’ results were better than girls was .......... where they achieved a pass rate of .........., which was 10% higher than .......... for girls. In general, .......... that during the period in question girls performed better in most subjects in the competency exams than boys.